October 6, 2017 – A team of astronomers led by UCLA professor David Jewitt has identified a “special comet” 1.5 billion miles from the sun. No other comet heading toward our sun has ever been seen at such a great distance. Jewitt said the discovery will enable scientists to monitor the developing activity of a comet over an extraordinary range of distances. C/2017 K2 (PANSTARRS), or K2 for short, is currently beyond Saturn’s orbit, and it has been traveling for millions of years from its home in the frigid outer reaches of the solar system, where the temperature is approximately 440 degrees below zero Fahrenheit. It was photographed by NASA’s Hubble Space Telescope, and the researchers’ observations were reported in the Astrophysical Journal Letters. K2’s orbit indicates it came from the Oort Cloud, a very large spherical region thought to contain hundreds of billions of comets. Slightly warmed by the remote sun, K2 has begun to develop an 80,000-mile-wide fuzzy cloud of dust, called a coma, that contains a tiny, solid nucleus of frozen gas and dust. 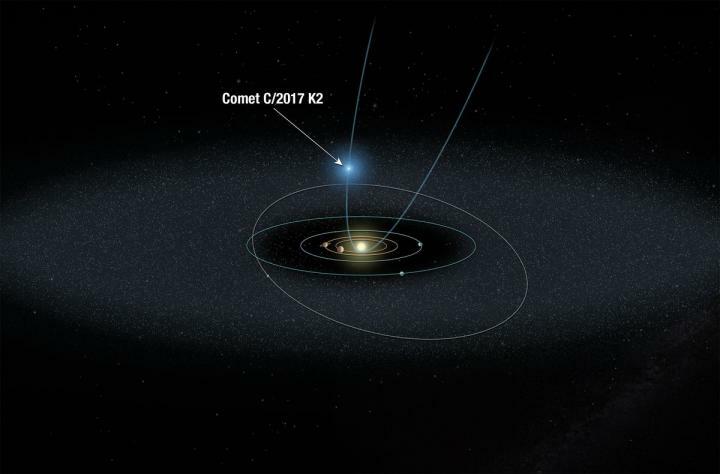 The new observations represent the earliest signs of activity ever seen from a comet entering our solar system’s planetary zone for the first time, as K2 is. “Because K2 is so far from the sun and so cold, water ice there is frozen like a rock, and we know for sure that the activity — all of the fuzzy stuff making it look like a comet — is not produced by the evaporation of water ice, as it is in other comets,” said Jewitt, a professor of planetary science and astronomy. He added that the comet is warming as it approaches the sun. Jewitt said the Hubble’s observations of K2’s coma suggest that sunlight is heating frozen volatile gases — such as oxygen, nitrogen, carbon dioxide and carbon monoxide — that coat the comet’s frigid surface; and that the coma is formed when those icy volatiles lift off from the comet and release dust. K2 was discovered in May by astronomers using the Panoramic Survey Telescope and Rapid Response System (Pan-STARRS), a survey telescope in Hawaii, a survey project of NASA’s Near-Earth Object Observations Program. Jewitt got a closer look at it in June with Hubble’s Wide Field Camera 3, which helped him determine the width of the coma and helped Jewitt estimate the size of the nucleus — less than 12 miles across — although the coma’s diameter is as wide as 10 times the diameter of the Earth. After finding K2 in the Hubble images, the researchers realized that the comet and its fuzzy coma had actually been photographed before — in 2013 by Hawaii’s Canada-France-Hawaii Telescope, or CFHT. Man-To Hui, a UCLA graduate student, identified K2 in data from the CFHT while searching images in a Canadian archive; but it was so faint that no one had noticed it when the photos were initially analyzed. One interesting aspect of Hubble’s K2 images was the absence of a “tail” — a signature feature of other comets. In the paper, the scientists write that this indicates that particles lifting off from the comet are too large for radiation pressure from the sun to sweep them back into a tail. “It should become more and more active as it nears the sun and presumably will form a tail,” Jewitt said. The comet will make its closest approach to the sun in 2022, when it will pass just beyond Mars’ orbit.